Successfully Added Deluxe Slider Cameraphone - Touchscreen Media Cell Phone to your Shopping Cart. Deluxe Slider Cameraphone - Touchscreen Media Cell Phone. 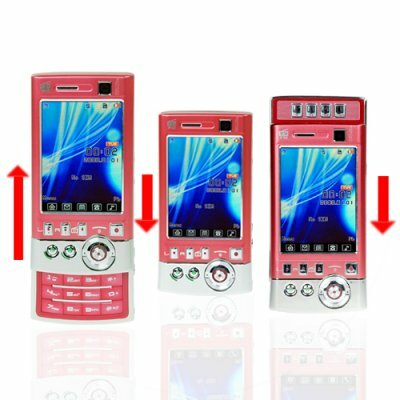 Dual Band (900MHz, 1800MHz) Deluxe Slider Cameraphone with crisp 2.8 inch QVGA touchscreen LCD display. This unlocked media rich touchscreen cellphone has dual SIM with dual standby, a super CCD digital camera with optical zoom and a game player with dedicated buttons as its signature features. This mobilephone includes Bluetooth, WAP, TV, and wonderful multimedia software with interactive menus to give you maximum pleasure out of your limited free time. With a wonderful file manager and UDisk feature, it has never been easier to load up a mobile phone with all your favorite music, videos, and NES ROM's to play while on the road. But don't let the slick looks and media features fool you, this phone has a fantastic dialing keypad, phonebook/contact manager, and dedicated buttons for switching between the dual standby SIM cards. You owe it to yourself to order a sample today and see how good it is for yourself. After that, you can order in a larger quantity so you can feature it in your online store, at which point we can provide you with your personalized discount quote. Brought to you exclusively from your direct from China wholesale source, Chinavasion Electronics. Dual slider touchscreen cell phone with rich multimedia software. Media friendly mobile phone with dedicated game and function buttons for easy use. I see this product has a 640x480 resolution, what megapixels is the camera? This camera has a 0.3 megapixel imaging sensor (640x480 = 300,000 pixels). What languages does the quad band dual SIM cellphone come in, I do not see ________ listed? The phone comes with a default selection of languages which are - English, Indonesian, Russian, Thai, Vietnamese, Turkish. If you need other languages and plan to order a large quantity (25+ pieces) then we may be able to supply it with the particular language you need. Does this phone have Italian language? This phone does not have Italian language. do you think that cameraphone it' s will working with AT&T proprely in usa. but anyway it 's very nice camerafone.